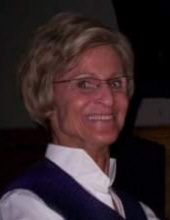 Vicki Jo Cashman, 67, of Grimes, formerly of Nevada, passed away Sunday, January 27, 2019, at the Village at Legacy Point in Waukee. Visitation will be 5-7 p.m. Thursday, January 31 at Rasmusson Funeral Home (1418 Fawcett Pkwy) in Nevada. Vicki was born February 3, 1951, in State Center, Iowa the daughter of Orville Luverne and Lucille Clara (Stoll) Weuve. She graduated from Nevada High School in 1969 and following graduation played semi-pro basketball for the San Francisco Warriors. Vicki was the first inductee into the Nevada High School Athletic Hall of Fame. On April 2, 1993, Vicki was united in marriage to Thomas Joseph Cashman at New Hope United Methodist Church in Des Moines. Vicki coached swimming for the Hoover-NW Marlins and was a member of the Fraternal Order of the Eagles in Palm Harbor, Florida. She enjoyed watching sports, refurbishing furniture, garage sales and yard work. Vicki was very active and loved spending time with her family. Vicki is survived by her husband, Tom of Grimes; her children: Scott McAtee (Laura Secory) of Grimes, Courtney Kramer of Ft. Worth, TX and Ryan Kramer of Portland, OR; her step-son, Dallas (Katie) Cashman of Nevada; her grandchildren: Jesse and Maverick McAtee and Cole Reese; her step-grandchildren: Brenna and Cora Cashman; and her brother, Jerry Weuve of Ames. She was preceded in death by her parents and a brother, Lynn Weuve. In lieu of flowers, memorial contributions may be made to Tom Cashman in memory of Vicki; an account has been established at Great-Western Bank. To send flowers or a remembrance gift to the family of Vicki Jo Cashman, please visit our Tribute Store. "Email Address" would like to share the life celebration of Vicki Jo Cashman. Click on the "link" to go to share a favorite memory or leave a condolence message for the family.